We investigate the economic factors that drive electricity risk premia in the European emissions constrained economy. Our analysis is undertaken for monthly baseload electricity futures for delivery in the Nordic, French and British power markets. We find that electricity risk premia are significantly related to the volatility of electricity spot prices, demand and revenues, and the price volatility of the carbon dioxide (CO2) futures traded under the EU Emissions Trading Scheme (EU ETS). This finding has significant implications for the pricing of electricity futures since it highlights for the first time the role of carbon market uncertainties as a main determinant of the relationship between spot and futures electricity prices in Europe. Our results also suggest that for the electricity markets under scrutiny futures prices are determined rationally by risk-averse economic agents. Renewable fuel standards, low carbon fuel standards, and ethanol subsidies are popular policies to incentivize ethanol production and reduce emissions from transportation. Compared to carbon trading, these policies lead to large shifts in agricultural activity and unexpected social costs. We simulate the 2022 Federal Renewable Fuel Standard (RFS) and find that energy crop production increases by 39 million acres. Land-use costs from erosion and habitat loss are between $277 and $693 million. A low carbon fuel standard (LCFS) and ethanol subsidies have similar effects while costs under an equivalent cap and trade (CAT) system are essentially zero. In addition, the alternatives to CAT magnify errors in assigning emissions rates to fuels and can over or under-incentivize innovation. These results highlight the potential negative effects of the RFS, LCFS and subsidies, effects that would be less severe under a CAT policy. We develop an analytical and numerical multi-market model that integrates land, fuel, and food markets, and link it with an emissions model to quantify the importance of carbon leakage relative to the intended emissions savings resulting from the Renewable Fuel Standard (RFS) for conventional biofuels. The expansion of biofuels mandated by the RFS can increase or decrease GHG emissions depending on the policy regime being evaluated. For example, replacing the Volumetric Ethanol Excise Tax Credit (VEETC) with the RFS, as occurred at the end of 2011 when the VEETC was allowed to expire, would reduce emissions by 2.0 tgCO2e in 2015 for an expansion of ethanol of 11.4 billion liters. A policy regime consisting of the RFS alone would increase emissions by at least 4.5 tgCO2e for the same expansion of ethanol. Our findings highlight an important tension between land and fuel market leakage. Policy regimes that result in less land market leakage tend to lead to more domestic fuel market leakage per liter of ethanol added. 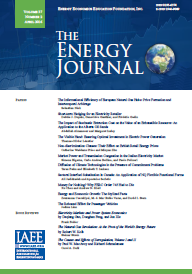 This paper investigates the effect of a carbon price on wholesale electricity prices and carbon-pass-through rates in the states comprising the Australian National Electricity Market (NEM). The methodology utilize an agent-based model, which contains many features salient to the NEM including intra-state and inter-state transmission branches, regional location of generators and load centres and accommodation of unit commitment features. The model uses a Direct Current Optimal Power Flow (DC OPF) algorithm to determine optimal dispatch of generation plant, power flows on transmission branches and wholesale prices. The results include sensitivity analysis of carbon prices on wholesale prices and carbon pass-through rates for different states within the NEM. Climate Policies: A Burden, or a Gain? That climate policies are costly is evident and therefore often create major fears. But the alternative (no action) also has a cost. Therefore, mitigation costs netted of the damage costs avoided are the only figure that can seriously be considered as the "genuine cost" of a policy. We elaborate on this view of a policy's cost by distinguishing between its "direct" cost component and its avoided damage cost component; we then confront the two so as to evaluate its genuine cost. As damages avoided are equivalent to the benefits generated, this brings climate policies naturally in the realm of benefit-cost analysis. However, the sheer benefit-cost criterion may not be a sufficient incentive for a country to be induced to cooperate internationally, a necessary condition for an effective global climate policy. We therefore also explore how to make use of this criterion in the context of international climate cooperation. Oil Price Shocks and the U.S. Stock Market: Do Sign and Size Matter? We investigate the effect of oil price innovations on the U.S. stock market using a model that nests symmetric and asymmetric responses to positive and negative oil price innovations. We find no evidence of asymmetry for aggregate stock returns, and only very limited evidence for 49 industry-level portfolios. Moreover, these asymmetries do not match up well with conventional views regarding en-ergy-dependent sectors of the economy. Instead, asymmetries are more likely driven by the effect of oil price innovations on expected and/or realized demand. We inquire whether the size of the shock matters in that doubling the size of the shock more (or less) than doubles the size of the response, finding that the effect of a 2.s.d innovation is just about double the magnitude of the impact of a 1.s.d innovation. Furthermore, we find no support for the conjecture that shocks that exceed a threshold have an asymmetric effect on stock returns. We analyze the effect of various combinations of state and national emissions policies on national emissions of a global pollutant, specifically, greenhouse gas emissions. We highlight the effect of unintended increases in out-of-state emissions on the efficacy of overlapping state policies. We show that emission taxes do not necessarily prevent a completely offsetting increase in out-of-state emissions when states add a state-level emissions tax to the national emissions tax. In particular, states small relative to their market will be unable to reduce national emissions with a state-level CO2 tax or a system of tradable permits. However, under a national cap-and-trade regime that allows states to be carved out, a state of any size can reduce national emissions by setting a tighter state cap. This combination yields a lower total cost than the equivalent combination of national and state CO2 taxes (if one exists) but increases the cost to consumers outside the market. Do countries with large energy endowments have larger energy-intensive sectors? We answer this question empirically using a panel with 14 high-income countries from Europe, America and Asia and 10 broad sectors, from 1970 to 1997. Energy-abundant countries have 7 to 10 percent higher employment and 13 to 17 percent higher net exports per value added in energy-intensive sectors vis-a`-vis otherwise comparable countries. Conversely, energy-scarce countries specialize in non-energy-intensive sectors. Using recent advances in panel data estimation techniques, we find that an appreciation of the U.S. dollar exchange rate leads to a significant decline in oil demand for a sample of 65 oil-importing countries. The estimated effect turns out to be considerably larger than the impact of a shift in the global crude oil price expressed in U.S. dollar. This finding appears to be the consequence of a stronger pass-through of changes in the U.S. dollar exchange rate to domestic end-user oil products prices relative to changes in the global crude oil price. Furthermore, we demonstrate the relevance of U.S. dollar fluctuations for global oil price dynamics. There exist two possible aggregation issues in studies to asymmetric price responses: (i) an issue due to aggregation over time, and (ii) an issue due to aggregation over space. Empirical studies already confirm the existence of the first issue. This paper confirms the existence of the second issue by studying daily retail prices of individual gasoline stations. I find that 38% of the stations respond asymmetrically to changes in the gasoline spot market price. Hence, asymmetric pricing is a feature of individual firms. By using our newly defined measure, we detect and quantify asymmetries in the volatility spillovers of petroleum commodities: crude oil, gasoline, and heating oil. The increase in volatility spillovers after 2001 correlates with the progressive financialization of the commodities. Further, increasing spillovers from volatility among petroleum commodities substantially change their pattern after 2008 (the financial crisis and advent of tight oil production). After 2008, asymmetries in spillovers markedly declined in terms of total as well as directional spillovers. In terms of asymmetries we also show that overall volatility spillovers due to negative (price) returns materialize to a greater degree than volatility spillovers due to positive returns. An analysis of directional spillovers reveals that no petroleum commodity dominates other commodities in terms of general spillover transmission. We analyze how a country's political institutions affect oil production within its borders. We find a pronounced negative relationship between political openness and volatility in oil production, with democratic regimes exhibiting less volatility than more autocratic regimes. This relationship holds across a number of robustness checks including using different measures of political conditions, instrumenting for political conditions and using several measures of production volatility. Political openness also affects other oil market outcomes, including total production as a share of reserves. Our findings have implications both for interpreting the role of institutions in explaining differences in macroeconomic development and for understanding world oil markets.